While lobster rolls, hot or cold, tend to dominate the spotlight, there is another treat that comes on a roll and deserves a bit of attention: the fried clam roll. On a summer day, little is better than having something easy and delicious on a roll, and the great seafood flavor that is imparted by the fried clam roll is the perfect fit. 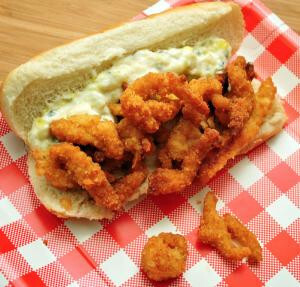 There is an ongoing debate between lovers of clam strips versus lovers of whole belly clams in their clam rolls. On the strip side are people who don't want as an intense a flavor as found with a whole belly. Strip-eaters are also not keen on the texture of the bellies. Lovers of fried clam rolls with whole-bellied clams claim that the flavor is much better and the burst of intensity from biting into a whole-bellied clam is worth it. A whole-bellied eater will tell you that the texture is much better than that of the strips, which can tend to be rubbery. Whichever side of the debate you fall on, a fried clam roll is a treat that everyone should get at least once during their Cape Cod vacation. And if you have yet to try a fried clam roll, consider getting two during your trip, one each way, so you can make up your own mind.